There’s much to love about Netflix’s bubbling cauldron of puberty and witchcraft. Here’s why Theo is the trans character we need to see on TV now. Note: the following contains some spoilers regarding the second season of Chilling Adventures of Sabrina. We live in a world where sexual orientation and gender identity are part of people’s lives earlier than ever before. Increased understanding about the LGBTQ community means kids can conceive of themselves as part of it (rather than simply “being different”). This means they need role models like Theo. Theo started Sabrina as the female identifying “Susie.” We’ve gotten to follow his journey from tomboy to young trans man. Sure, there have been moments of confusion and self-discovery along the way. However, it’s important to see him own his truth. He declares that he feels power in being called by the male pronouns which feel right to him. And what starts as a bid to join the Baxter High boy’s basketball team because there is no girl’s team becomes a moment of self actualization. When he aces the tryout (with a little help from Sabrina), his friends rush over to congratulate their friend Susie. “It’s Theo now,” he confidently replies. 3. His friends and family are supportive but not perfect. Audiences often see one of two reactions when a character begins to manifest a trans gender identity. On one extreme, we have a stubborn unwillingness to accept it. On the other, we have a picture-perfect acceptance that models good behavior but often not real life. While generally modelling good behavior, we get to see the gang come to grips. Harvey, mystified, asks Roz, “So, it’s just Theo now?” And when Sabrina – having missed the memo while caught up at the Academy – refers to him as Susie, she is quickly corrected. When Theo comes out to his Dad, he also exhibits a reasonable amount of reticence. He is initially reluctant to lose his best “girl”, but ultimately comes around to acknowledge Theo’s truth. 4. The Baxter High bullying is real, but it gets better. Elsewhere at Baxter high, the students are initially less accepting of Theo. This is a situation with which many trans kids can relate. Theo’s initial attempt to change in the boys’ locker room is met with leering and verbal mockery. (It’s a power play to which many kids – trans and otherwise – can relate to.) These bullies also eventually pull a classic transphobic move – filling Theo’s locker with feminine hygiene products. But after one of the bullies is injured, he comes to apologize with a changed heart. Later, Theo even reports that his teammates have come to like him and respect him. It’s a quick turnaround but should offer hope to trans kids who fear they’ll never fit in. 5. He takes steps toward changing his exterior but understands that’s not necessarily the endgame. It is, admittedly, thrilling to see Theo’s physical transformation. His close-cropped new haircut makes him look both great and comfortable in his skin. And he seems super sharp when he shows up to attend the school dance in a suit. However, when someone offers him the chance to magically transform his physical exterior to match his identity, he confidently refuses. He knows that his body is not what makes him a guy, and he already knows how to put it into words. 6. He is played by a non-binary actor. We live in a world where straight actors have earned major kudos for playing LGBTQ characters. While there are reasons we can appreciate those performances, it’s worth asking the gatekeepers to show us LGBTQ actors bringing their experiences to these roles. 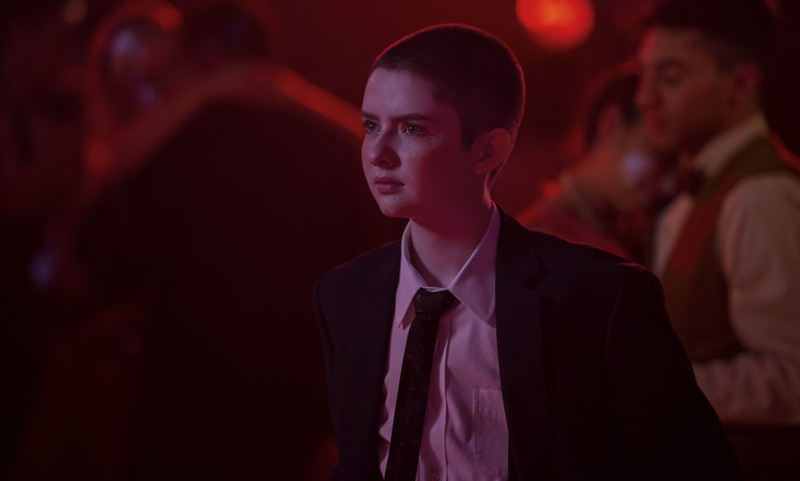 When non-binary actor Lachlan Watson landed their role on Sabrina, they were one of the youngest self-identified non-binary actors on the scene. Watson has revealed that they used their own experiences to keep the character’s storyline authentic. Interested in cinematic explorations of gender? Check out eleven top transgender films.